We’re back again with a quick update on the latest G R Electrical Services news for July 2018. I’ll lead by saying the work diary is very busy at the moment which we’re really grateful for! I’m not sure how busy other Electricians in Rotherham are at the moment, but we’ve had to work Saturday and Sundays over the last 2 weeks to keep us on track. Sometimes it’s just got to be done. Secondly we have taken on a new member of staff too!!! A big welcome to Mark who has slotted straight into our team and is already making a huge difference in the amount of work we can take on and complete on time. It’s really challenging staying on top of blogs, paperwork and generally trying to keep all our customers happy by sticking each of their schedules on the electrical work, hence the missing June blog! That being said I’m hopeful we can stay on top of it all and keep delivering moving forward into August! The majority of our work has been house extensions since we last checked in. Location wise they’re all pretty local to us 2 x being in Wickersley and a separate job in Carlton in Lindrick. You can’t beat local work! Check out out featured image for a really effective finish on our extension in Brecks Rotherham. We’ve taken on some large projects including a renovation project in Wickersley with a large extension to the rear. We are also wiring another house extension at Brecks in Rotherham. It’s taken a fair bit time upgrading some defective wiring to bring it up to a safe standard, but all plastered now 2nd fixed looking really well. 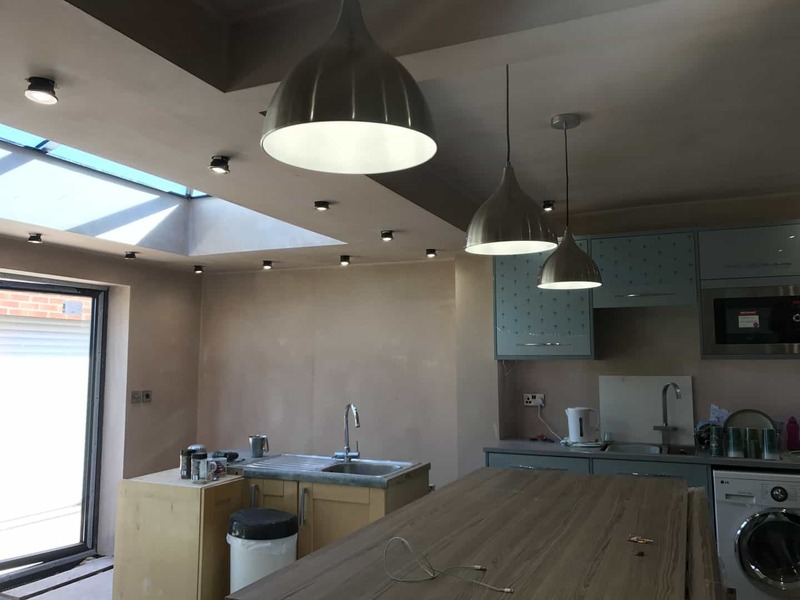 Both these projects have lots of LED spotlights being wired, fuse board upgrades and both have new kitchens being put in which give them the wow factor. We’ve actually completely re-wired the socket and lighting circuits in one of them so everything is brand new in line with the new kitchen. In addition to this we started wiring an extension in Bramley for a plumber friend on his home build project which is due to be plastered this week. Check out our Facebook page over the coming weeks for photos of the jobs we’ve been on. We’ve done a fuse board change in Sheffield this month which involved moving it from a base unit in a kitchen into a wall unit at high level. This particular job gave me inspiration for another blog I will be putting together soon on fuse board changes. We as electricians in Rotherham hear all the time from potential customers about fuse board changes being ‘an easy job’. I’ll be putting forward some talking points that will explain the process we go through from quoting a job right through to final electrical testing and issuing a certificate. The bathroom jobs also keep rolling in with 4 being completed this month alone. All in all I’m happy to say we’re busy and still winning work. 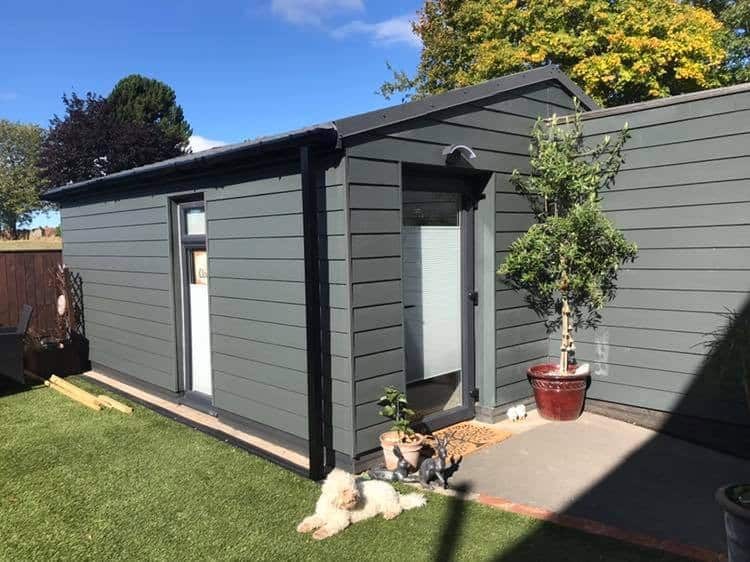 Give our Facebook page a visit (and a like) to see up to date in progress pictures of the jobs we’ve completed recently. Until next time, thanks for reading and good night!